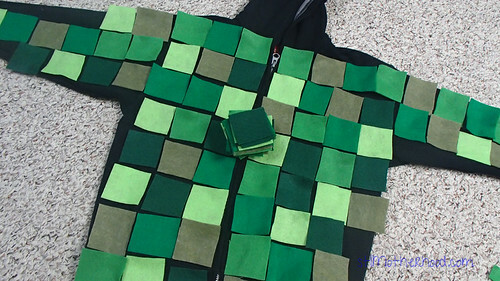 Easy Minecraft Creeper Costume...that's comfy to wear! 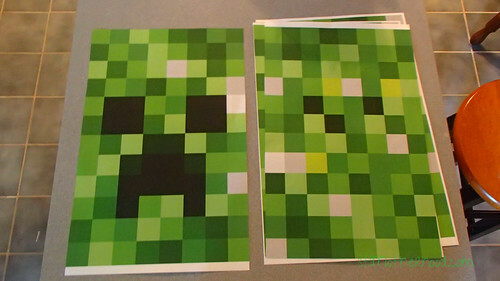 Home » Easy Minecraft Creeper Costume…that’s comfy to wear! 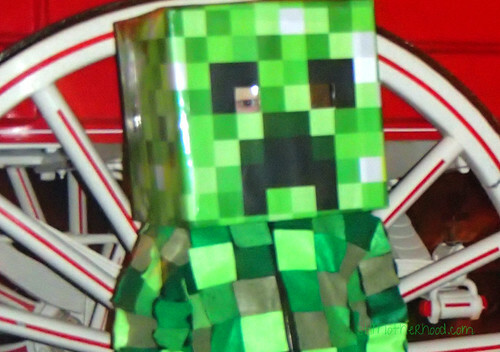 Easy Minecraft Creeper Costume…that’s comfy to wear! Mitch plays Minecraft. A lot. Let’s leave it at that. 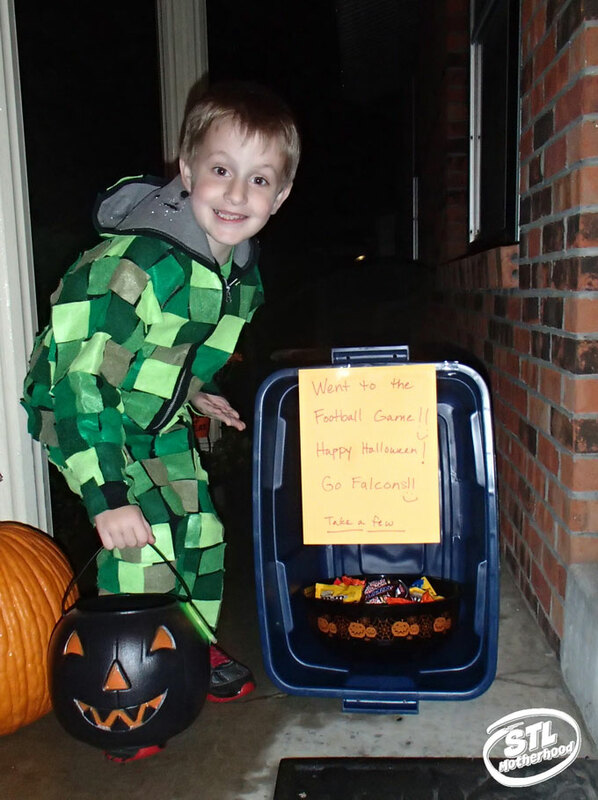 Naturally, when we were kicking around ideas for a Halloween costume, he wanted to be something Minecraft related. And scary. Like a Creeper. If you don’t know what I’m talking about, go ask any kid. When Mitch first wanted to be a Creeper for Halloween the game was pretty young and just getting started with spin-off merchandise and whatnot. 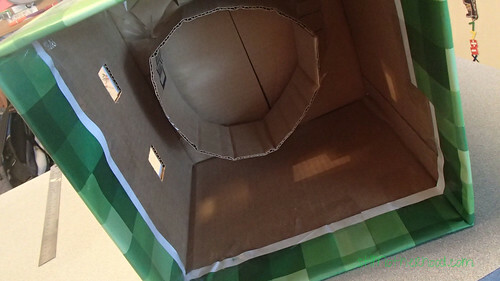 Sure, you could find a Minecraft t-shirt at Target, but for some reason, not a costume. They’ve since flooded the toy aisle with Minecraft action figures, plushies and weapons…but I’m still not sure if you’re going to find an off the rack Minecraft costume yet. Not that I like to buy costumes anyway. I turned to the web and found many interesting costume ideas, but not many patterns. Mostly the creeper costumes involved sticking your kid in box, and believe me, the last thing you want is a six year old in a box. I wanted him to be able to run around on Halloween, not hop up and down in an uncomfortable costume! I came up with something a little less authentic, but more flexible. 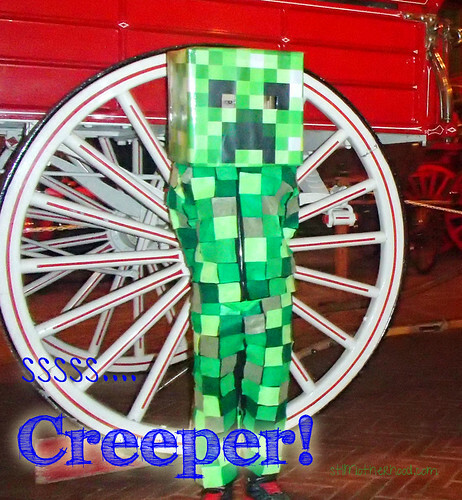 A Creeper sweat suit. Mitch could not only Trick or Treat in this costume, but we took it to Boo at the Zoo and Grant’s Farm Halloween nights and actually…sit down. And ride the trams, trains and carousels. I thought that was a plus. First, a warning: this costume is for Halloween, not a Comic Con. It’s not realistic. Heck, it’s not even straight in spots. But it is pretty easy to put together if you don’t mind hot gluing a few hundred squares of felt. If a link takes you to Amazon, it’s an Affiliate Link, which means I get a small commission. Thanks! 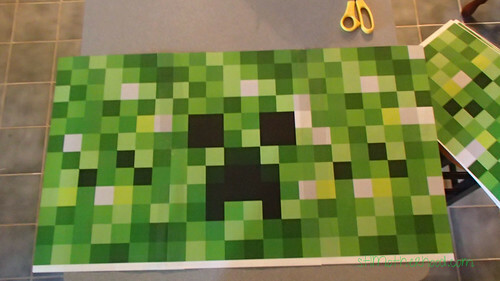 Click here –>Print out the printable creeper mask. In color. What? Four sides? Yes. The extra sheet is needed if your box is a little over 10.5 inches wide. Trust me on this. The fifth “side” sheet is for the top. Cut out one square in the black for eye holes. 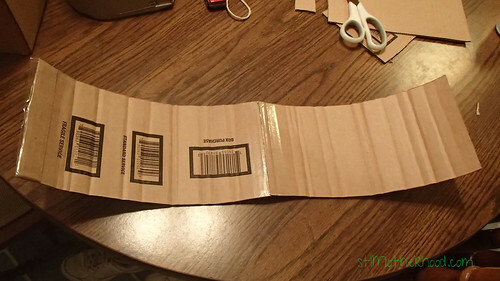 Place the printout on the box, trace the square and cut. 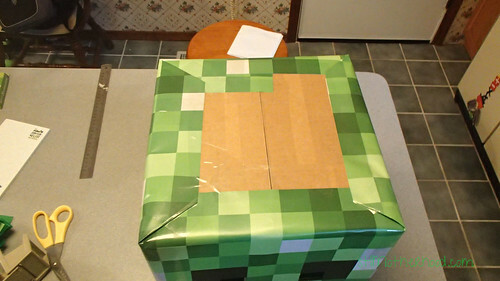 Wrap the paper around the box gift wrap style. 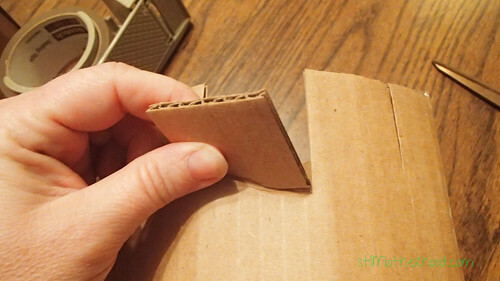 Fold it around the inside edge. Tape. Tape. Tape. Trim a piece for the top. Tape some more. 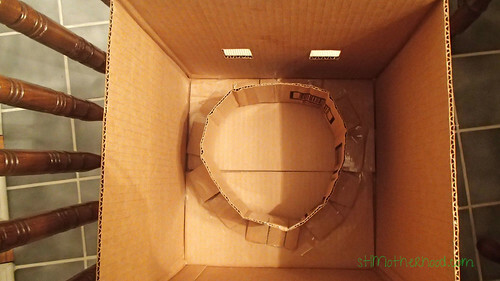 Notice that inner ring in the box up there? Yeah, about that. See, if you put an 11×11 box on a six year old’s head, you end up with a kid that can’t see as it spins wildly around his head. So we taped the leftover flaps into a headband and taped it to the top of the box. Genius! The headband is taped close to the face for better visibility. The body is pretty simple. 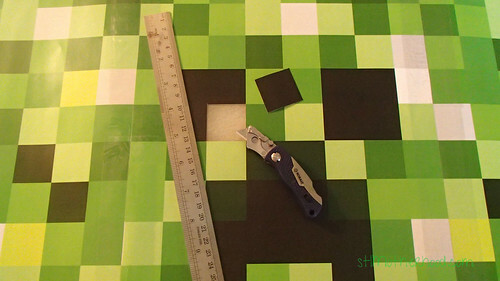 You cut out lots of felt squares and glue all over the suit, more or less in straight lines. I’m not Martha Stewart here, so I’ll admit my suit has some…interesting bits. Just remember this is a Halloween costume and unless you’re competing for a $5000 prize, no one is going to care if there’s some squares that aren’t quite square. Besides, real humans are NOT square, so you’re going to run into trouble around arm pits and neck lines. Just do your best. I started with a bottle of fabric glue for this project, but it takes too long to dry. And I tend to make costumes at best, 24 hours before they need to be worn. 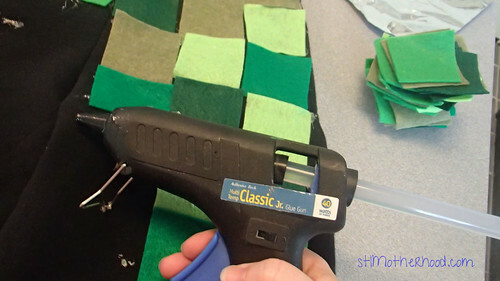 I switched to a glue gun for speed–the glue dries instantly and had a GREAT bond. Just dap glue in the four corners, anything more is overkill. How much felt? 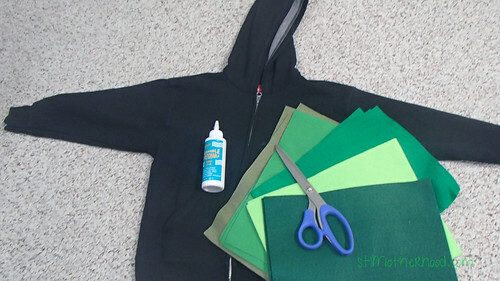 Well, I used 30+ pieces of felt in five colors of green to cover a boy’s small hoodie and pants. You may need more. Or less. 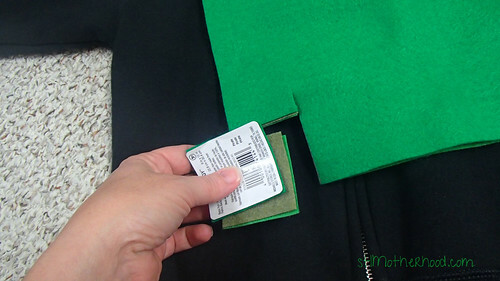 I also used a random size for the squares, which happened to be the price tag of the felt. You could make your squares bigger and maybe get it done faster. Don’t worry about straightness. Unless there’s prize money on the line. In that case, you should be reading someone else’s tutorial. NOTE: I’ve also see the costume head done in paper. 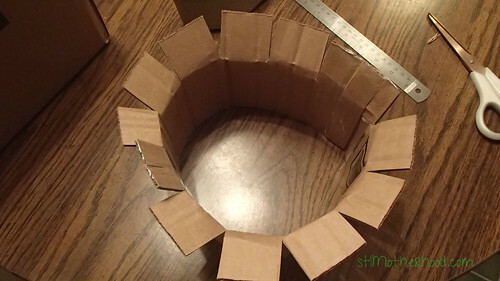 If you’re a scrapbooker and have leftover green paper, it might be cheaper to make the head from little paper squares glued to your box. Just use the printable as a guide for the face pattern!